My mom has a nice built-in cookbook stand in her kitchen. It’s the perfect place for keeping your cookbooks while you’re cooking or baking. A lot of the recipes I use are found on the Internet so unless I print them out I need to make room for my laptop in the kitchen. So here’s my modern-day cookbook stand! 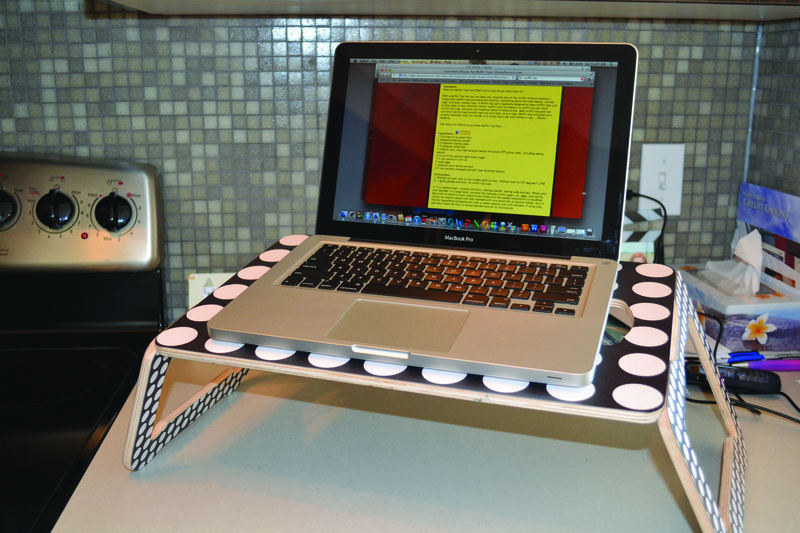 Using this laptop stand from Ikea keeps the laptop off the container and away from potential spills. very clever. now i just need to start cooking. lol. Ingenious! I could have done with that the other day when I mamaged to pour a glass of wine into my laptop. It was amazzing the whole glass went in not a drop escaped. I think its still in here but the laptop just keeps on working!